Digital agencies are notorious in IT circles. The line between work and fun is thin and hazy. Creativity is the mantra, chaos comes free. Influx thrives in chaos and revels in creativity. But order is a must, which brings us to the topic at hand. In the red corner, we have Asana (backed by the inimitable Dustin Moskovitz) and in the blue corner, we have Flow by MetaLab. Heavyweight vs. Flyweight? or David vs. Goliath? To put things in perspective - Asana is a $280 million corporation founded by Dustin Moskovitz(co-founder of Facebook) and Justin Rosenstein, its task management software left its beta stage in November 2011. On the other hand, Flow is designed by MetaLab - one of the top interface design firms. However, this is their first(albeit commendable) attempt at a task management software. Flow being the last one to the table, naturally has more expected of it - having been built on learnings from established products in the market. It does not disappoint - right from the start you have a pure and unpolluted experience, allowing you to go about your work with minimum interruptions. True to its name, there is a smooth transition between tasks for the user - be it creating a new project, delegating a task to another user or adding more users to the group. MetaLab’s interface design works like a charm and the software is seamless. Mac support and a beautifully crafted mobile application is the icing on the cake. As of now, Flow is developed and supported by a small team of nine members. Asana is the established giant, with years of presence in the task management field. Its robustness and myriad of features make it the obvious choice for those with a discerning eye. Asana has often been criticized for having too many features that result in a rather steep learning curve(countless video tutorials speak for themselves) - this is more of a compliment to its design than a criticism thereof. Their mobile app, though initially lacklustre has been given a makeover, combining performance with a pleasing interface. The resources that Asana’s substantial development team possess inspire more confidence, pushing the scales ever so slightly in its favour. Based on our experience fiddling around with the tools, these are the ratings we awarded them. Both Asana and Flow support agile project management (Cycle Time analytics on Asana, and Kanban lead time on Flow). Both offer Android and iOS support for their mobile apps. Both Asana and flow have email notifications, but only Flow has mobile push notifications. While Asana allows milestone tracking and time tracking, Flow does not. After using Asana for so long, Flow’s keyboard shortcuts fell short of our expectations. This means we would have to search for every option on the dashboard of Flow, which is both annoying and time-consuming. Flow seems to be easier to use for a beginner. It can be instantly deployed and is fairly easy to learn on-the-go. Asana may prove to be more of a challenge, requiring some amount of time and effort to master(especially keyboard shortcuts). However, we felt it was well worth it - Asana helped us go about our business a lot quicker due to its many features. MetaLab has given Flow a Zen-like interface, it just works. It is tremendously usable! The best way to put it would be to quote Flow’s motto “Task Management Software That Doesn’t Feel Like Work”. 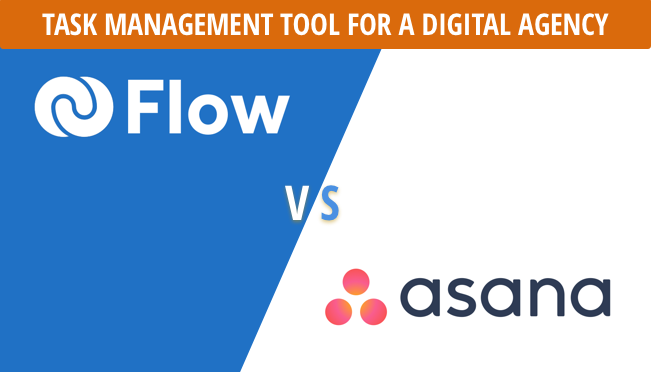 Asana looks good, but we felt Flow wins hands down. As far as usability is concerned, Flow outshines Asana with its uber-minimalistic approach, proving less is indeed more. We believe Flow was also the first to come up with the idea of tabs for projects, under which we could list out tasks that were associated with that project. Asana later adapted this into their tool. Asana is free for less than 15 members. That’s right - FREE. This is to help support startups, the thought does count. In the corporate jungle, the little startups do need a hand. Flow on the other hand only provides a 15 day trial period, but there is no limit to the number of members allowed. For premium users, both Flow and Asana come to about $8 per head (for a team of 70 members). Both Asana and Flow support Android, iOS devices. The new app from Asana is a huge improvement over the previous version. Though some reviews suggested that Flow has a better mobile app, we didn’t notice any significant differences. Overall, we thought both of the tools serve their purpose, making work easier and help mitigate the chaos(to some extent). We feel you can’t go wrong with either of these! Putting it simply, Flow is the casual designer, lounging on a couch in his jeans, sipping a latte and working on his iPad. Asana is the espresso-chugging, three-piece-suit-wearing professional. The best part is that neither will burn a significantly larger hole in our pocket than the other (having over 70 members, we exceed the free use limit on Asana). It was close, but we decided to go with Asana and we are loving every minute of it!